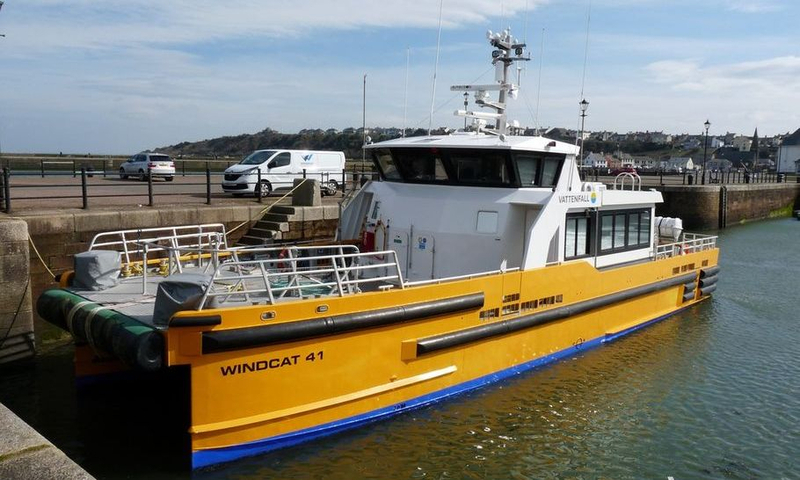 "Windcat 41" pictured at Maryport marina. Quite a difference from the early MK 1 boats built in 2006/7. This 23m MK 3.5 boat is capable of 25 knots and can carry 45 passengers to work on the offshore windfarms. 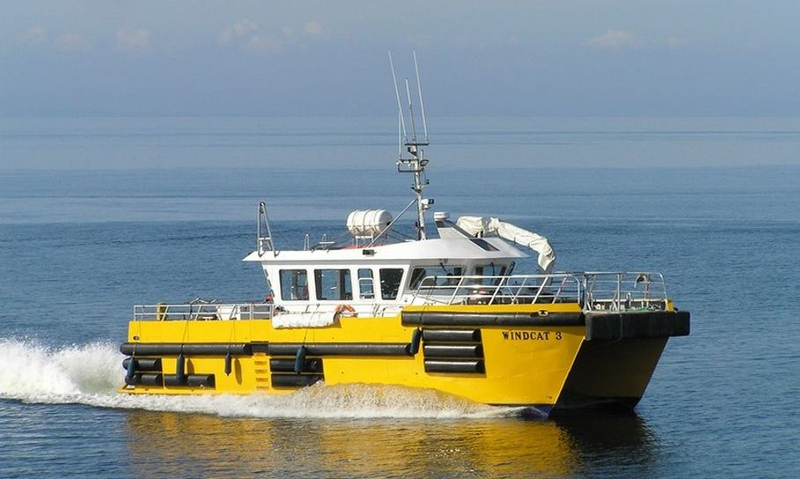 "Windcat 3" and "Windcat 4" were used on the Robin Rigg windfarm in the Solway Firth. Pictures of the entrance channel to the port of Workington at low tide shows the large build of silt and mud across the bar.This is caused by the river Derwent meeting the sea and dropping its debris and other factors such as the tidal current and a reduced dredging campaign. Worryingly it may also prevent the launching of Workington's all weather lifeboat at these times. In May the Round Britain Sailing Tour in aid of Macmillan gets underway with a flotilla of yachts departing from Fambridge Marina, Essex on the 6th and ending back there on June 29th. They are expected to call into Whitehaven Marina about June 7th. The tour goes anti clockwise cutting from the east coast to the west coast via the Caledonian canal. From Whitehaven they will sail over to Ramsey IOM before heading south again. 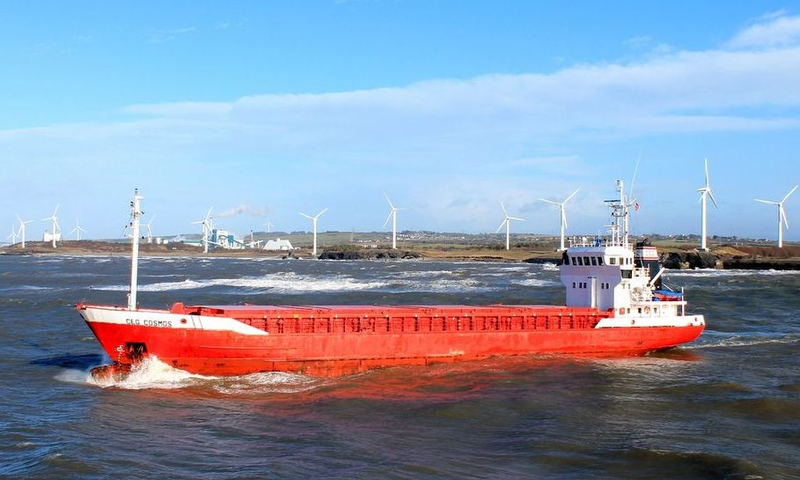 2018 saw a large increase in vessels calling at the port of Workington, a total of 179 ships of various types arrived compared to 128 in the previous year. This increase was mainly due to the logs and wood chippings shipments arriving for the local board mill, these alone accounted for 115 of the total (which rose from 68 in 2017) The average figure over the past 5 years was 134 ships per year. These figures are unofficial and taken from my diary so may be subject to error. The most frequent ship calling in 2018 (with logs-naturally!) is "CEG COSMOS" making an amazing 57 visits. Since the closure of the local steelworks and the resulting loss of trade to the port of Workington new cargo had to be found to allow the Cumbria County Council owned port to remain open and viable. Over the following years the mainstay of the port has now become logs and wood chippings for the local boardmill and is now the largest percentage of the types of cargo the port handles. Below is a random selection of a few of the vessels that have called with the logs and chippings. Fleetwood Lifeboat arriving at Workington on a dull wet day to be lifted out of the water for maintenance. The Shannon class "Kenneth James Pierpoint" 13-14 was met by the Workington boat, "Dorothy May White" 13-19, and escorted into the port and to the davit crane where it was safely hoisted out of the water. 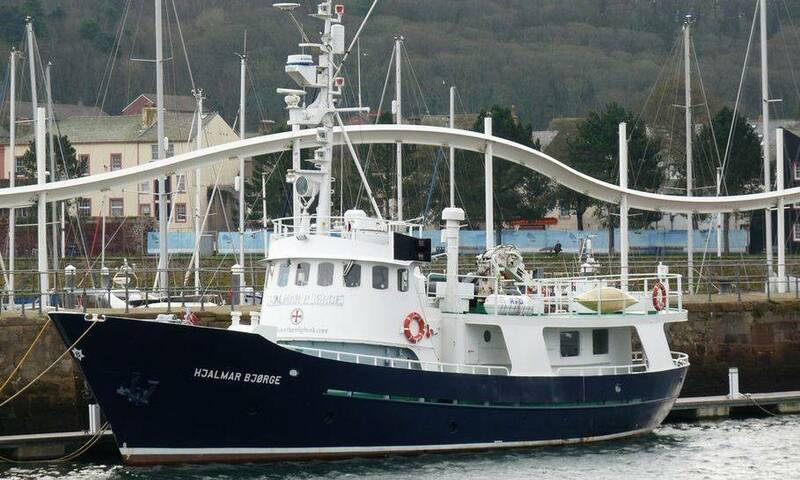 Moored in Whitehaven is "HJALMAR BJORGE" a luxury charter vessel owned by Oban based Northern Light Charters. Built in 1963 she was originally one of thirteen Norwegian rescue ships. The vessel specialises in cruising around the Hebridian Islands in the north west of Scotland and carries a maximum of 12 passengers. A Look Back...After the transporting of criminals to Australia ended in 1868, a fleet of over 800 ships that had been used for the job were made redundant. About 164,000 people had been deported from when the practice had started in 1788. One of the ships used, "Louisa" had been built in Workington. 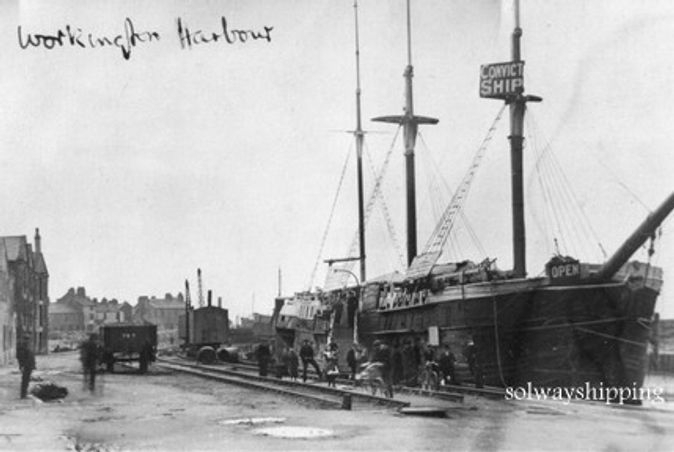 The redundant convict ship, "Success",pictured here in c1908 at Workington, visited various ports around the country as a tourist attraction, visitors could board and see the cells etc and have their picture taken for free...on a Sunday. It was originally built in 1840 in Burma for British owners to use to carry cargo between Britain and the East Indies but after quite a checkered life including being a prison ship,was bought by Australian entrepreneurs and fitted out to be convict ship museum complete with wax dummies of prisoners and all the associated torturing devices and chains etc. After a very successful tour of Australia she set sail for England where she continued touring for another 50 years before being refitted in Glasson dock in Lancashire and then departing for America in 1912. Local film maker Julia Parks has made an amazing short timelapse film of ships in the Solway Firth ports, watch it here.